Asus’s Zenbook series has been know for its stylish design, great looks and exceptional performance throughout the years. This time it is no different. New range of Asus Zenbooks were launched couple of months ago globally and now they are available in India. The size ranges from 13 to 15-inches and we got the mid version, which is the 14-inch variant over to the office for review. We took this nifty laptop out for a spin and this is what we could make of the new ultrabook. This is our review of the Asus Zenbook 14. 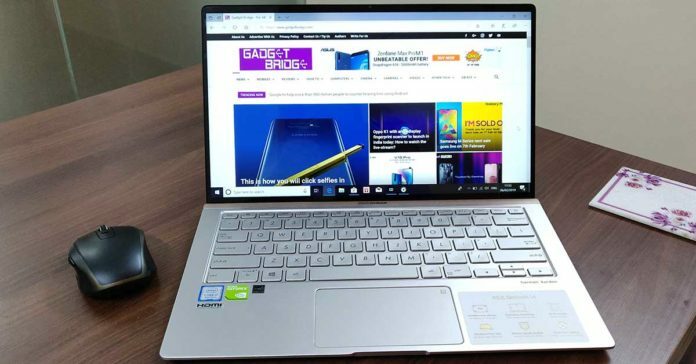 So, before we go ahead, let us start by saying that the Asus Zenbook 14 is one of the smallest notebooks in the Indian market, which has a graphic card within a small frame. The laptop is smaller than an A4 printing sheet when it comes to its width. Out of the box, the first thing you will notice besides its slim body is the 14-inch full HD display. It is almost bezel-less and gives you a wide viewing experience. The screen to body ratio is at a high 92 percent. The display is ravishing and one can watch it for hours. Though the laptop is small, the display does not seem to be very small, even when you are watching it with your pal or spouse at home. Viewing angles are great and the text on screen is crisp. The ghosting is minimal and one can rarely see it stutter, even when playing demanding games. We are reviewing the silver version of the laptop ,which also has Blue as another colour option. The metal body is smooth and you can see brushed aluminum all around it. Lift the top lid (which also has Asus’s branding on it in rose pink) and you will notice that the lower part lifts a little. Yes, it does by 3 degrees. The LCD panel has an ergolift hinge setup that raises the bottom part of the laptop for a more ergonomic feel. This actually helps, if you are in the business of typing a lot. The Asus Zenbook 14 features a large chicklet type backlit keyboard (has three brightness levels) with slightly raised keys. There is a full numeric keypad also hidden in this gem. Where is it, you ask? 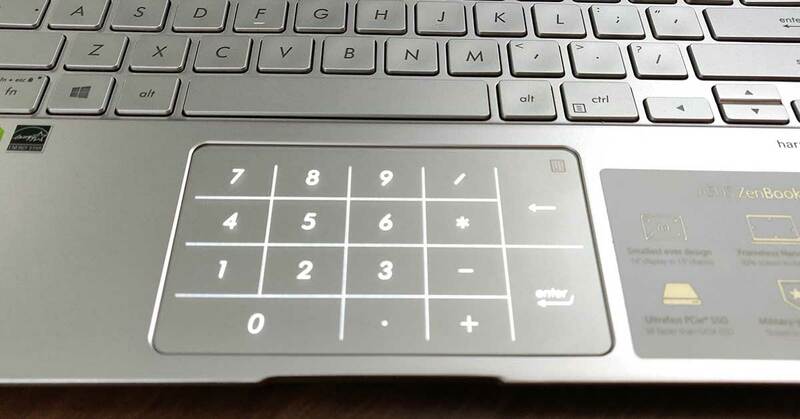 It is embedded on the trackpad, which doubles up as a touch sensetive numeric keypad. Talking about which there is a layer of glass on the trackpad. To access the numpad, one has to press the numpad button located on the top right of the trackpad. 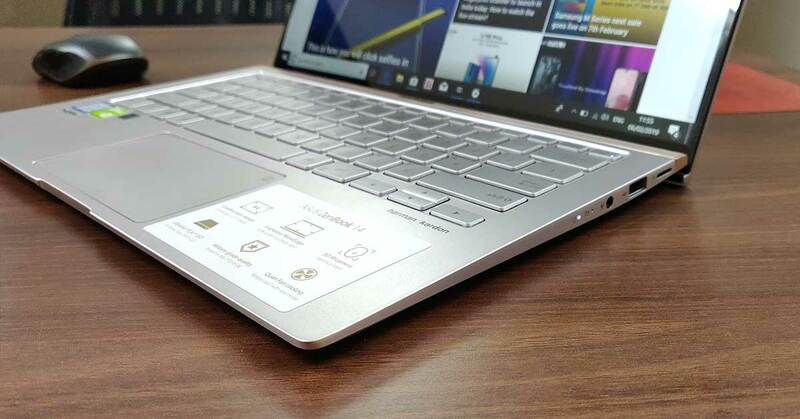 Asus has placed a mesh style golden layer above the keyboard with the Zenbook branding on it, adding to the show. 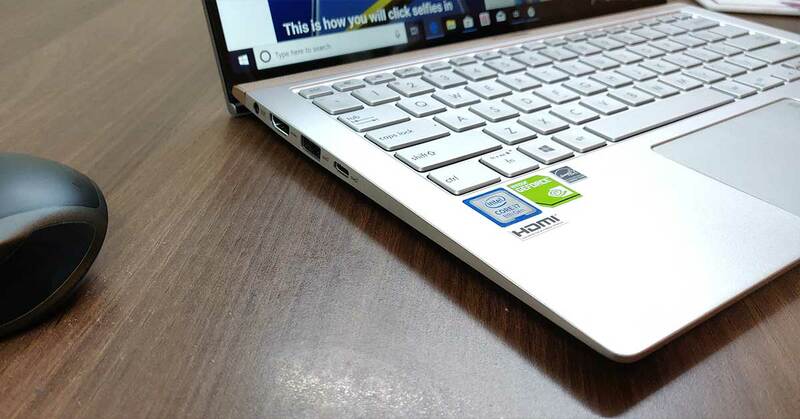 Users will find a microSD, USB 2.0 and a 3.5mm audio port on the right side of the laptop. While on the left, Asus Zenbook 14 sports a power, HDMI, another regular USB 3.1 as well as USB type C ports. Twin Harman Kardon speakers are neatly tucked under the front side of the laptop. These are somewhat down-firing, so that users get better resonance. The keyboard also has all the usual multimedia functions, with the power button located on the top right. An HD web camera has also been thrown in to the mix, which can face unlock this laptop. All in all, at just 15.9 mm slimness the Asus Zenbook 14 is a great machine to look at and gets full marks in the design department. Now on to the fun part. The Asus Zenbook 14 is an absolute power house, when it comes to under the hood performance. This laptop has Intel Core i7 8th gen 8565U CPU with clock speed of 1.8GHz. This is coupled with 8GB RAM and 512GB SSD storage. Graphics are powered by NVIDIA GEFORCE MX150 graphics card, which come into play when you are playing a game or are using a render software. Otherwise, for normal usage this notebook also has Intel’s UHD 620 on board graphics. So why the combination of graphic units? Simple, to minimize battery consumption. If the discreet graphic card is being used all the time, the battery will drain out rather quickly. For faster internet speed, Asus has also put in a Gigabit-class WiFi chip in the Asus Zenbook 14. This is 12 times faster than the regular 802.11n setup. Bluetooth v5 has also been added and the company claims the battery can last up to 13 hours. However, on our tests which did involve gaming, working on word documents, browsing the internet and video chatting. The battery lasted for about 8 hours. Which is really great for a machine this small. The sound of the Asus Zenbook 14 is also not bad. Harman Kardons do perfect justice to the notebook and the speaker set is pretty loud for the size. Voice clarity is good and bass is somewhat there. Movie audio experience with them was not bad at all. Working on the notebook is not shabby either, the ergonomics play in its favour and we loved the large trackpad on it. However, we are not a big fan of having the numpad on it, since at times we did slip and slide the pointer away while pressing a numeric key. Asus Zenbook 14 comes with Windows 10 preloaded and has minimal bloatware. A lot of the 512GB SSD is available to work with. Talking about which, the SSD makes this laptop start and shut down in a jiffy. Software load quickly and we didn’t have any problems with it. Games do take some time, since there is only 8GB RAM available on this device, however this laptop is not from Asus’s gaming series. Even if it can run games like PUBG, DOTA 2, CS:GO etc with ease. On PC Mark 10 the Asus Zenbook 14 scored 6553 points on the productivity test. Which puts it up in the top of the pack. We are sure if it was the 16GB version, we would have gotten even more marks in the test. However, this is not bad for a laptop that weighs just a kilogram and is extremely portable. In the box users also get a small pancake size charger and a carry sleeve, along with a USB to Ethernet adaptor, since adding an Ethernet port would have meant increasing the laptops size for Asus. Overall, we loved the experience this notebook brings with it. We were not able to find too many flaws in this laptop, except its exuberant asking price. If you can afford it (Rs 89,990) and want the best Windows experience, go for it, as it will not only get to you that second look, it will last you for a long time too. Sulabh Puri is the Editor In Chief of GadgetBridge.com. A content specialist, he started his career young and it has been a rewarding 15 years for him. Before heading Gadget Bridge, he was the Editor of Times of India (TOI) Technology and GadgetsNow.com. He has also led TOI’s international edit arm as the Editorial Head of Business Insider India and Tech Radar India. He has also worked with various media houses such as the India Today Group and Cybermedia. He loves everything ‘gadgety’ and enjoys tinkering with new tech toys and automobiles. A graduate in commerce from Delhi University, he is also an adept graphic designer. When he is not working, he can be found in the kitchen, cooking mouth-watering chocolate cakes and croissants.